Suddenly I am seeing MINIs everywhere, saw at least 10 today, including a bunch of classics! No, San Diego hasn’t become cool all of a sudden – I am currently back in England where the MINI is definitely popular. 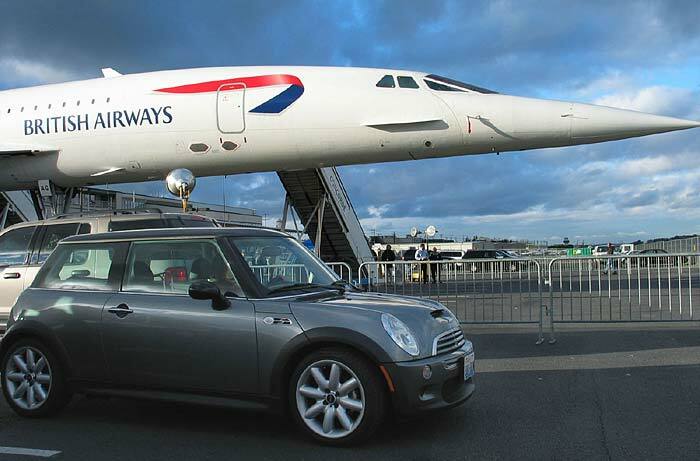 Had to share this picture I found at MINI Mania, combines perfectly my love of the MINI and aviation. It reminds me that I need to take some pictures of Sarah next to the Cessna 172s that I fly. But in the meantime, enjoy this and the other pictures in the gallery from whence this came. Vegas Weekend is Shaping Up! Latest news on the Vegas Vacation website suggests the event is going to be a hot one. Goodie bags for all participants, a fun run with door prizes that include a nitrous injection system – vroom! Only two weeks to go. Whats wrong with all the BMWs? I got a call from Brecht’s on Friday telling me that the parts are in for my MINI repair. The bad news is that the earliest they can fit me in is Feb 12th!! Must be a lot of faulty BMWs and MINIs out there for them to be that busy. The kicker is that I now won’t have my ABS and DSC working for the Vegas trip, guess I won’t be driving like a maniac. Saw this on the Bridger MINI forums, a PC built inside a MINI Cooper, new style comes to your desktop. Like others have said, it really should be a Linux or OS X machine, the MINI is too cool to be Windows based. Took Sarah to Brecht’s today and they looked at the problem with the warning lights. Turns out that the sensor on the right front wheel is broken and needs to be replaced. They have ordered the part and I will go back in a couple of weeks to have it fitted. Only saw one MINI today, a red with white roof, parked in the tiny mall on Clairemont Mesa where the chipsandmemory.com store is (I was buying a new computer to ship to my parents). San Diego must be starving for MINIs, I had way more waves, smiles and shouts from people passing by than I have ever had. It doesn’t look like the MINI is getting old hat just yet. So it took me a long time to decide for sure whether to go but I am finally booked up for the MINI Vegas Vacation, Feb 6th to the 8th. Unfortuantely Teri can’t make it so I’ll be going on my own, hopefully my fellow SCMM’ers will keep me out of mischief. Expect to see lots of pictures after the event. For the last few weeks the humidity out here has been such that every time you get out of a car and touch the door (or anywhere) you get quite a shock. I even get a shock getting into the MINI and when I put my hand on the handbrake for the first time; I can feel the hairs on my arm standing up as I slide into the seat. Its not just me though, I see many people getting out of their cars and either gingerly closing the door so as to avoid the shock or, more likely, jumping at the inevitable static discharge on their hand (not to mention accompanying profanity). I finally got a comment system installed for this little ol’ blog. Now I don’t know if anyone other than the googlebot looks at these pages so perhaps I wasted my time but if you want to let me know your thoughts, please do. For a while I had broken the archives but I think I finally have all the different tools and servers playing nicely together. For the last couple of weeks, Sarah has been displaying some warning lights: the flat tyre warning, the ABS and the DSC. I had thought this meant I had a flat tyre but the tyres are fine and, more importantly, the manual says this indicates a failure of the ABS or DSC system and that the car should be driven “carefully”. The car drives fine but I have stopped taking the 25 mph curve on Austin Road at 60mph just in case. So, its back to Brecht’s on the 9th for them to look at it. It could all be academic though, if our green card interview on the 8th goes badly I might be deported on the 9th!